In a much anticipated announcement, the Israeli company, Delek, and its partner, the Houston-based Noble Energy, announced the signing of an agreement that will enable the export of Israeli gas from the Tamar and Leviathan gas fields to Egypt via Dophinus, an Egyptian company. The $15 billion agreement paves the way for the export of 64 million cubic metres of gas from Israel to Egypt over a period of 10 years starting in 2019. The companies are exploring various transport options, including an existing pipeline between Egypt and Israel. The deal was hailed by both Israeli PM Benjamin Netanyahu and Egyptian President Abdel Fattah el-Sisi who, despite some criticism, stated that Egypt “scored a goal” with the agreement. The deal was met with some scepticism on social media. Some Egyptians wondered why Egypt was signing an agreement with Tel Aviv just three weeks after the opening of the country’s own gas field (Zohr), which was described by some officials as able to make Egypt self-sufficient by 2019-20 when combined with its other reserves (although this is rather unrealistic). The deal certainly strikes a chord among the broad segment of Egypt’s population that doesn’t support the normalisation of ties with Israel despite the peace treaty between the two. Yet, the country’s leadership, which is known to have a good working relationship with the Israelis, decided that the benefits of the deal in terms of prestige and economic prospects far outweigh the risks. The agreement can, indeed, be considered a success for Sisi, at least on the economic level. Since the discovery of various oil fields in the Eastern Mediterranean, two main export options have been considered. The first is the building of a new pipeline through Cyprus and Greece to Europe, one that would require significant investment, yet is seen as an option for the Europeans, who are seeking a stable alternative to Russian gas. The second, which Cairo favours, is the export of liquified natural gas (LNG) through existing terminals in Egypt. 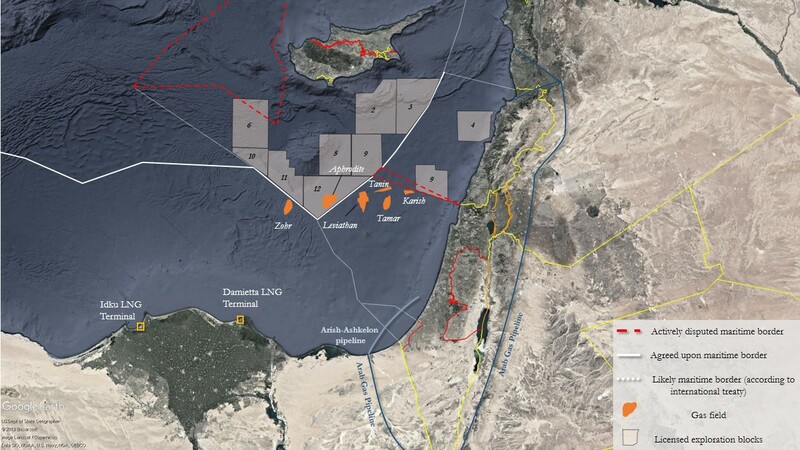 This would require the import of gas from non-Egyptian gas fields, including Israel’s Leviathan and Tamar, as well as the Aphrodite field in Cyprus. In this context, Bloomberg reported that Egypt was in the final of phase of talks to import Cypriot gas. The agreement concluded this week with Israel thus comes amid efforts to turn Egypt into a “regional energy hub”, as mentioned by Sisi. New agreements with Cyprus and Israel means that Cairo is seeking to both meet domestic needs and become a net exporter of gas. There are, however, many challenges to that long-term vision. The first one is the ever-expanding domestic consumption. Egypt has been trying to reign this in through the reduction of subsidies, as these artificially increased consumption and made it largely impossible to control energy usage. The country is also expanding its own infrastructure with the building of new plants over the past two years. Yet, this is unlikely to be enough and more painful reform will be needed to turn Egypt into the regional energy hub it wants to be instead of just another giant consumer of energy. This is, of course, in addition to the above-mentioned political risk, with the deal another sign of the purported close relationship between Israel and Egypt. The broad crackdown on the opposition and seeming apathy of most of Egyptians can give the perception that this political cost is null at this time. The Egyptian government likely expects that the weakened opposition will find it difficult to truly mobilise broad segments of the public. By comparison, the country is far less susceptible to political unrest related to an agreement with Israel than Jordan, which hosts a significant population of Palestinian nationals and descendants yet still reached a deal with Israel. Yet, the issue of what some outlets have dubbed the “alliance” between Egypt and Israel would certainly become a problem should the situation in the Gaza Strip escalate, the risk of which Le Beck has assessed is increasing despite Hamas’ reluctance and Egypt’s own effort to maintain the quiet. In this context, the generation of protesters who spearheaded the 2011 revolution was partly formed during the Mubarak-era protests related to the conflict between Israelis and Palestinians. However, the Egyptian leadership likely feels confident that the potential political discontent related to improved relations with Israel despite the lack of settlement with Palestinians is far less likely to mobilise the public than socio-economic discontent, should the economy not improve. Claims that Hamas has been involved in attacks in Sinai, mostly by the government and pro-government outlets, may have also eroded some support for Palestinians, although this trend should not be exaggerated. Recent demonstrations regarding the US recognition of Jerusalem as Israel’s capital last December have shown that public expressions of support for the Palestinian cause are still non-negligible (particularly given the overall crackdown on non-government approved protests) yet was more limited than under Mubarak, for instance. Furthermore, the stability of the current regime largely derives from socio-economic rather than political factors. This is despite the heavy-handed crackdown on the opposition and the de facto return to the pre-2011 status quo, as highlighted by the fact that Sisi will go into the upcoming elections effectively unopposed. It has also pushed the Egyptian president to make painful economic reforms that are expected to stabilise the economy in the medium term, and are likely more to blame for a downtick in his popularity than the current political climate. The geopolitical risk to the agreement and its implementation are largely tied to the stability of the current government. Indeed, it is possible that another government would not have signed such a deal with Israel, although even that is a debatable topic given Egypt’s constant need for further energy sources. Still, the seeming close relationship between Sisi and Israel certainly helped resolved some of the most prominent issues regarding the agreement, including a still existing dispute over the termination of a prior agreement that saw Egyptian gas delivered to Israel. While the stability of the Egyptian government may seem high at the moment, over the 10-year period that the agreement is set to cover, the risk of leadership change is not negligible. We assess that Sisi’s ability to remain in power largely depends on both the military and his ability to satisfy the broad Egyptian public through improvement to the economy. All of these issues are discussed on a regular basis in Le Beck’s intelligence products. On the security level, given that the deal is likely to include the building of a new pipeline or the use of an existing one in Sinai, the project will have to take into account the security landscape in the area. Several prominent threats include the presence of Islamic State (IS) militants, as well as threats related to Gaza and Hezbollah, the latter of which recently made direct threats against Israeli gas fields. Regarding the former, before pledging allegiance to IS, Ansar Bayt al-Maqdis had carried out multiple attacks against the section of the Arab Gas Pipeline (AGP) that runs through Sinai to supply Jordan. While the export of gas to Egypt will be done through another pipeline, any onshore facility could present a valuable and achievable target for IS, which has shown on many occasions, most significantly during the 2015 attack against the 101 Battalion in al-Arish, that it is capable of targeting even the most fortified areas across the Peninsula. Moreover, given the militant group’s own experience, including an attempt to commandeer an Egyptian frigate and the destruction of an Egyptian navy ship, a sea-borne attack is also something that should not be ruled out, despite the current scope of counter-insurgency operations.